A few weeks ago I had the opportunity to go on a field trip to see some Neoproterozoic turbidites in the Canadian Rockies (see this post). While the detailed sedimentologic and stratigraphic work is being done on a relatively undeformed section, the mountains in this region are chock full of folded and faulted strata. I thought this one was particularly spectacular. 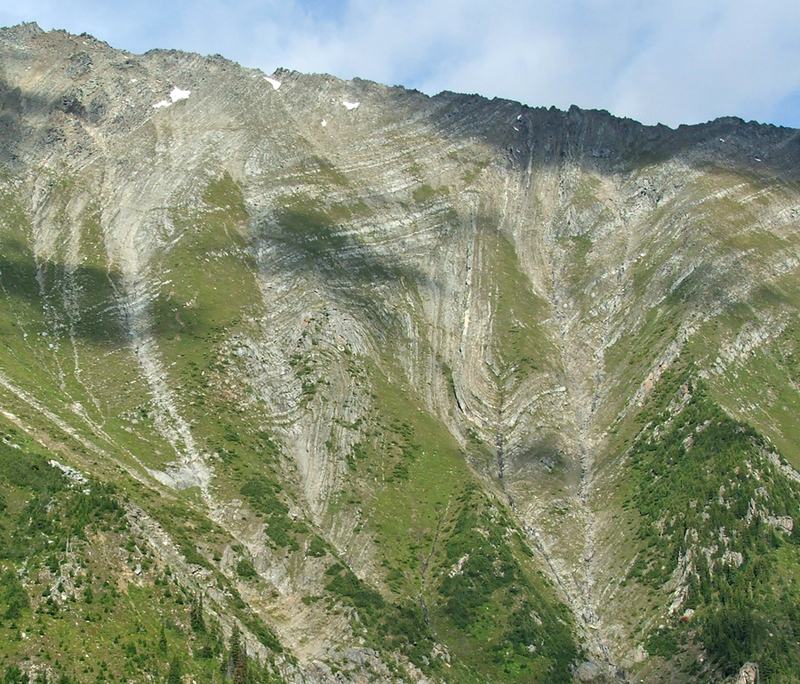 Okay, all you structural geology geeks … what are we looking at? Give me some wildly comprehensive interpretations based on this one photo. Is it me, or are the axial planes of the folds getting shallower towards the top left? Looks like you might have a low-angle fault in the top left too. I’d say that the folds you’re seeing are pre-faulting, with the faulting causing fault propagation/drag folding of the pre-existing axial planes. Of course, that could be total rubbish. I should say that I’ve stolen this idea: my first “image of the week” is now up. This reminds me of Folded Mountain in the northern Canadian Rockies way out along the Alcan (Mile 409) – presumably in the “overthrust belt” – so I’ll go with some kind of thrust-related folding, also. That photo makes me wish that I had one of those laptops that you can write on, so I could take the photo into Structure in an hour and sketch on the photo while I talk about it. Maybe I’ll have to bring in the image and sketch it on the chalkboard instead. Also – which direction are we looking? wilsontown … that all sounds good to me! Kim … we are looking generally towards the north in a north-south trending mountain range, so it’s a fairly close to a strike-perpendicular cross section. You are looking at a structure after which a major oil company is named. the photo is so nice that now is my desktop!!!! what your viewing is second-order folding in the allothonous section of a major east vergent crustal shortening event that is approximately penecomtempraneous with other late paleozoic to Jurassic crustal shortening associated with nevadan-sevier protracted contraction. These particular folds demonstrate up to 60% overall crustal shortening and the collective axial traces can be used to retro-deformably calculate the geometry and kinematics of the underlying fault-bend structures that are best described using a strictly thin-skinned contractional model consistent with models developed be Adolf Yonkee, Richard Almmendinger, et al. in reference to the characterization of sevier aged deformation documented south, and along strike of these structures. Joe … awesome, love it. Hey, who says we’re geeks?